SteamWorld Heist is a game of little things that elevate simplicity into something blissful. SteamWorld Heist opens with a 40s style news reel telling us how the earth shattered apart and now exists as an exposed planet core surrounded by rocky debris. The imagery is grand but cartoony with robotic "cowbots" replacing all flesh and blood people. It's a perfect encapsulation of the retro-future-steampunk-western style that defines the game. Then the news reel ends, and the main menu appears with a theme song so damned perfect that you'll want to spend hours just sitting on this menu screen. It's a jaunty frontier earworm that goes well with the steambot outlaw life. SteamWorld Heist is a game of little things -- clever art, smart design, simple controls -- that work to elevate this relatively simple game into something blissful. You play as Piper Faraday, captain of a ship that was just raided by Scrappers. With your having been crew hauled off to be parted out and your supplies low, you begin doing odd jobs for cash... Well, not cash exactly, water, which has replaced cash in this world of steambots and space deserts. Little details like that (of course steambots would build a society around water) make the game so surprising. It’s filled with fascinating world building that isn't doled out in long expositional speeches or through encyclopedia entries. Instead, SteamWorld Heist teases the imagination with a throwaway line about parents giving their limbs to literally make a child, contrasted by the horror of zombie bots being rebuilt from various scraps. Or the fact that the Royal Space Force exists as the oppressive government because they're dieselbots and thus require less water than the steambots to survive. The plot stays tightly focused on Piper and her crew, but it's clear that they exist in a world with its own society and values and prejudices. Most of that world building comes from the crew and the bits of backstory they offer up after you take them on a mission. Work camps and oppressive governments come up in casual conversation, adding an emotional weight to these cartoon robots. Each crew member that you recruit begins as a cliché, but over time they're all (robot readers please pardon the expression) fleshed out: the loyal pilot who has literally been built into the ship, the grumpy old seadog who lost his wife to salt rust, the hard-worked hard-edged farmer looking for justice, a mercenary dandy, an aged soldier, and more. The best thing that I can say about the character work is that I came to like them all despite myself. I started the game more interested in the gameplay than the story, but over the hours spent playing, the crew grew on me until I cared what each of them had to say after a mission. The story itself is surprisingly engrossing, continually upping the stakes in a way that feels natural and thrilling. What begins as a mission of revenge turns into a bit of do-gooding, which then turns into a rebellion of sorts, and then into a battle for the fate of all steambot kind. In many ways this is the Firefly/Serenity game that fans have always wanted -- a ragtag team of western-styled space outlaws fight against vicious raiders and a totalitarian government up to suspicious things in deep space, eventually learning that the two just might be connected. That fighting takes the form of a 2D, side-scrolling turn-based strategy game. Those labels sell the game short, though, as it pulls off a neat trick of feeling more like a cover-based shooter than a strategy game. The action may progress in turns, but it feels fast and demands a keen eye. Like any cover-based shooter, waist high walls are essential for survival. Even if you're just behind a barrel that only offers half cover, it's better than being caught out in the open. Enemies will often miss if you're behind something, but they'll also try to flank your weak side, adding a definite strategic element to the combat. Robots will climb up ladders to get above you, jump off platforms to get below you, or just charge you with a shield, anything to get you out of cover. This means that you can't stay still. Hunker down just long enough to pop off a shot, and then get the hell out of there. Enemy types keep changing, and new dangers are consistently added to the environments. No fight feels the same, and the tactics that you rely on in the beginning won't serve you by the end. You're forced to adapt to different circumstances, like explosive liquid leaking onto the floor, teleporting enemies, and even flying enemies. SteamWorld Heist is a surprisingly long game, and it only gets better with each passing hour. However, the main selling point of combat is something that I, at first, thought was a glitch. When you're ready to shoot, there are no dice rolls to determine if you'll hit. Instead, your robot arm extends and begins to drift up and down. At first I thought this was a bug in the controls, but in fact, you have to manually aim each shot, which means accuracy is entirely based on skill. When a bot is behind a barrel with only a bit of its head exposed, you have to eyeball the angle yourself. Hitting a target at a distance is genuinely tough, so when you pull off a good shot, it feels satisfying in a way that other turn-based games are not. And in a nice little touch, if you nick their head, you can actually shoot their hat or helmet off and collect whichever one for yourself. There's no practical reason for this, but it feels damn cool. Adding to the satisfaction of a good shot is the environment that encourages trick shots. Bullets regularly ricochet off walls, and many corners of a level are designed to let you a bounce a bullet around cover -- if you're good enough. This adds another layer of skill to the manual aiming, but also helps to sell you as the scrappy underdog. You gotta fight smart, attack in ways that the enemy doesn’t expect, and hit them from behind as you’re standing in front of them. Every successful trick shot makes you feel like a badass sticking it to The Man. Combat feels easy at first. The manual aiming means that I hit every shot while the enemy's dice roll means that they often miss. However, later levels do get quite challenging, and if at any point, the game feel too easy or too hard, the six(!) different difficulty levels ensure you can always tweak the challenge until it feels just right. This is a game that wants you to have fun, and it freely gives you the tools to ensure that fun is had. The one part of SteamWorld Heist that doesn't seem fully fleshed out is the economy. You can use your earned water to buy new equipment, but since you're a pirate, you collect a fair amount of loot from each battle, including new equipment. The only thing worth buying from shops is increased inventory space because any gun that you see for sale you'll likely find over the next couple fights. You do lose a percentage of your water reserves if you fail or abandon a mission, and at first, this seems like a harsh punishment, something to discourage players from challenging themselves. But once you realize the water is mostly symbolic, with little practical value, this punishment becomes moot. It's nice that the game goes easy on the player, XCOM this is not, but this bit of player-friendliness design seems weirdly accidental. Like it's only friendly because the economy isn't properly balanced. 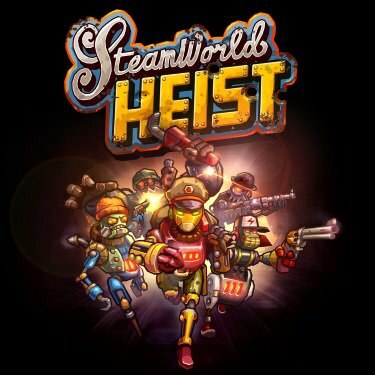 Economy aside, Steam World Heist is a smart, cleverly designed game with some superb world building. The story sets you up as a ragtag group of outlaws, while the combat and inventory and other design elements make you feel like a ragtag group of outlaws, not to mention the inspired music and the art, which distinguishes each character and enemy type at a glance. Altogether, they make for a surprising, amazing gem of a game.